I started reading this book because of my own personal disgust at the rise of "intelligent design" in the US education system and I felt that my background in the physical sciences needed supplementing in those of the biological arena. Where better to start arming myself I thought than the work of the grand-father of evolution - Charles Darwin. Most people know, that Darwin came up with the theory of evolution after years of studying. In particular, he studied the material, notes and theories he had got after an immense five year long round the world trip in the Beagle. This book is a (presumably transcribed later) set of his notes from that voyage, what he saw in terms of flora, fauna, geology and what he experienced along the way - in particular the peoples and cultures of South America and Australasia. This isn't an easy book to read - its the journal of a Victorian scientist just about to hit the peak of his career, as such it's peppered with references to other scientists, studies, ideas and contemporary references. I didn't recognise half the place-names in South America, presumably because they have changed as the European powers dominated that place less and less. It's also more than a scientific narrative. Insights into many aspects of the Victorian world can seen - from the nature of life at sea, to attitudes to animals and people. It's also annoying the continuous lauding of "Englishness" as a way out of poverty, for "uncivilised peoples". Though he can be touching in his innocence for instance he writes of the Tahitians. They are very tall, broad-shouldered , athletic and well-proportioned. It has been remarked that it requires little habit to make a dark skin more pleasing and natural to eye of a European than his own colour. But even though he is angered by slavery and the treatment of indigenous peoples, he hasn't shaken off all the racism inherent in the society he lives in. For instance he writes that the Tahitians display "extreme good sense" at one point. Yet a few pages earlier he says that savage man has "reasoning powers only partly developed". But what strikes the casual reader will be Darwin's immense love for nature and the world around him. Even though this is then tempered by some of his methods for taking samples. A fox....was sitting on the rocks. He was so intently absorbed in watching the work of the officers that I was able, by quietly walking up behind, to knock him on the head with my geological hammer. It's difficult to imagine any modern naturalist hunting and killing like this. But that's a reflection on the Victorian desire to fill museums as a method for advancing knowledge I suppose. The book is littered with accounts of shootings of birds and other animals as Darwin gets samples for his research. Throughout the work and the trip Darwin is clearly grappling with a world and an understanding at odds with established ideas. Time and again he notes how geological formations must have taken aeons to develop. His famous description of the finches in the Galapagos Islands is clearly that of a man on the brink of a new idea. His discussion of the spread of disease towards the end of the book carries both the naive views of the science of that period and the germ of something else. If you read this, I would recommend having some sort of reference to Darwin's voyage at hand, because it is useful to known what else happens on the voyage - in particular his relationship with the captain, and the sharp arguments they had over slavery. The understanding of evolution that Darwin was able to unleash on the world was to change the world of science totally. But it would almost certainly have happened without him, though perhaps the explanation would have taken a little longer. Evolutionary thought works precisely because, as this work shows, it is the product of scientific exploration and observation. It is for this reason that it far outstrips any other, baseless idea that some on the religious right would force upon our school children. it was really late at night when i read this entry and ended up spending even longer reading the entire wikipedia article on darwin as a result. i'm reading 'marx's ecology' right now and think that reading more darwin is a good place to go next. Thanks for that great review and I agree with you about 'intelligent design'. It's a shame in the face of modern science that some people revert to such stupid ideas and try to sell it as science as well. Ouch. Ooh, I want to read Marx's Ecology. I'm on something of an environmental/marxism kick at the moment (a slow running one; it's been going on for a few years now). 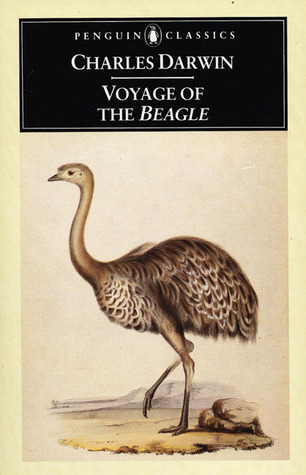 This review, of the Voyage of the Beagle, was quite helpful to me. I agree that the intelligent design stuff is depressing and infuriating. The thing is, it doesn't come all from one source, either: the African-American churches are just as prone to it, in Oakland, as white fundamentalist denominations. Possibly not FROM THE PULPIT... but oh, my god, the first time (and every subsequent time) I tried teaching human evolution as part of the sixth grade (11 to 12 yr. olds) ancient history curriculum? God. And I mean that literally. They never shut up about god, or about not being descended from apes or ape-like ancestors. although, i understand all of your viewpoints, i am a strong believer in intelligent design. What makes it stupid? Why is it so hard to believe that their is a greater power out there? In genesis the bible states that God created man in his own image, and breathed life into him. How is this more outrageous then being evolved from apes? I think you are right; I would get far more out of this than the fictional account I tried. The mere snippets of quotes you provided have convinced me I would find Darwin's own account far more interesting and detailed.